Free to download, Plants vs. Zombies 2 will expand and extend the classic gameplay of the original and provide players with dozens of all-new levels, plants and zombies across multiple worlds at no cost. While the vast majority of the game will be entirely free to play (players can face every zombie and access every level in every world at no cost), Plants vs. Zombies 2 players will also be able to purchase upgrades and other in-game items. Designed from the ground up as a live service, the ever-expanding universe of Plants vs. Zombies 2continues the epic struggle of plants defending your brainz against zombies from your backyard through the vast reaches of time, both past and future. New worlds with new levels, plants, zombies and new ways to play will be released on an ongoing basis. Leveraging the touch interface of Apple’s popular mobile devices, Plants vs. Zombies 2 includes all-new touch-screen power-ups that enable players to “break the fourth wall” and interact with zombies directly, as well as via plant defenses. BI notes that Clow, who has been making Apple ads since the 80s, shared some memories from his 30-year relationship with Jobs at a PTTOW! summit. Is Adobe’s SEO company planting links in blogs? 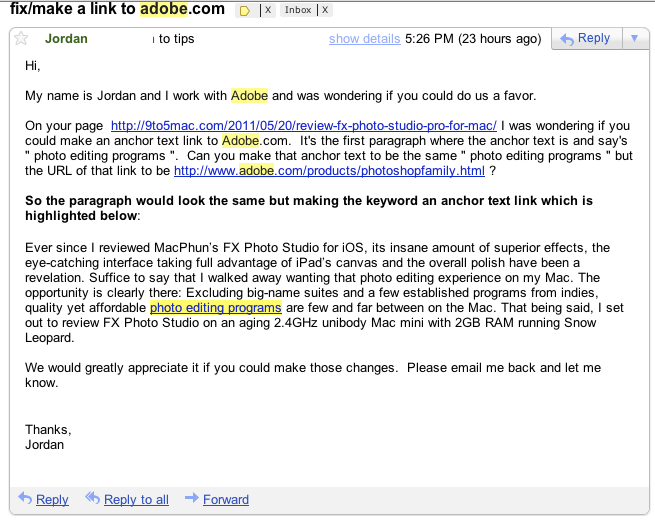 A guy named Jordan from 97th Floor, a company that represents Adobe’s SEO interests, asked us to “fix/make a link to Adobe.com” in one of our posts. The post had nothing to do with Adobe, but the terms “photo editing program” were desired link terms for Adobe which appears to be trying to juice its search engine rankings. As far as I know, this is a no-no. I think Bing and Google frown on this type of behavior.